ESET is proud to announce that fifth generation of it’s flagship product ESET Smart Security has been recognized as the best internet security product by the highly respected German testing organization Stiftung Warentest. Millions of people in Germany rely on Stiftung Warentest’s independent expert product reviews to help them make well informed buying decisions. The influential test published on the Stiftung Warentest website and in the April 2013 edition of the magazine highlighted ESET Smart Security’s advanced Firewall and light footprint “ESET offers good malware protection, one of the best firewalls and barely burdens the PC,” says Stiftung Warentest. The resulting mark was the best of the 14 tested internet security software suites and ESET Smart Security demonstrated all round strength by being the only security package to receive the “good” mark in all separate testing categories: protection, firewall, usability, and system footprint. “Good malware detection and protection is not enough these days. The combination of the right layers of protection such as Antivirus, Antispam, Firewall, Parental Control, and in Version 6 – Anti-Theft feature, provides the essential level of security. We are happy that Stiftung Warentest agrees with this philosophy which is proven by their outstanding evaluation,“ says Ignacio Sbampato, ESET Chief Sales & Marketing Officer. Since the test ESET has further strengthed its products with the release of a new improved generation of its flagship products: ESET Smart Security 6 and ESET NOD32 Antivirus 6. ESET Smart Security 6 provides all-in-one internet security, while ESET NOD32 Antivirus 6 is a fast and powerful antivirus. The new generation provides even greater detection of infiltrations, improved cleaning and faster scanning due to the enhanced engine. 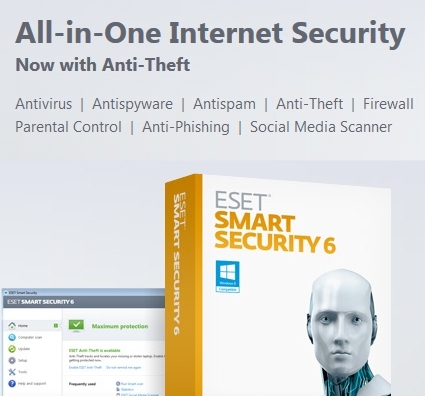 Furthermore, the ESET Social Media Scanner App also comes standard with ESET Smart Security 6 as well as ESET NOD32 Antivirus 6, offers protection against Facebook threats. This is my preferred quality virus programs on systems that I’ve contributed to thank each pouch.